Sardines are awesome. And that’s not just because they were the first fish ever to be canned (although that’s pretty cool, too). These tiny, oily fish are incredibly nutrient-dense and provide a whole host of cardioprotective, cancer-fighting, bone strengthening, immune-building and skin-revitalizing nutrients. 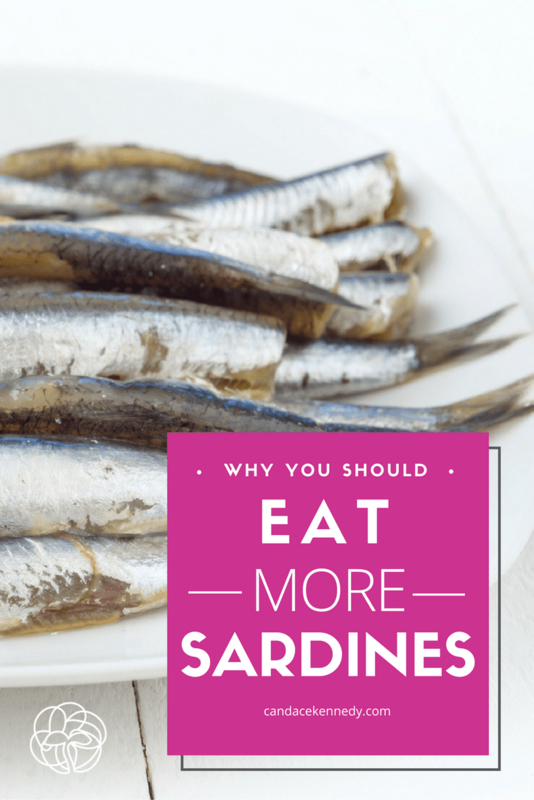 In this post we will discuss some of the many sardine health benefits. The beauty of sardines is that their small size allows for easy consumption of the whole fish — that’s organs, bones, meat and skin. To those who are used to a Standard American Diet, the concept of eating the whole animal may seem foreign, and perhaps a little intimidating. However, eating foods like sardines, in their whole form, gives you a high concentration of nutrients (especially minerals!) that can be hard to find. Sardines are an excellent source of neuroprotective nutrients such as vitamin B12, omega-3 fatty acids, and selenium. Omega-3 fatty acids, such as EPA and DHA can promote cognition and increase blood flow to the brain. They can also improve your memory and reaction time. Studies show omega-3s can improve your mood and reduce aggression, fatigue and depression. They may even help make you less aggressive when you’re stressed out. [4,5] Good to know for those times I get pretty hangry. Also, selenium. Sardines are a great source of selenium (one of my favorite minerals!). Sardines have about 87% of your daily requirement of this potent antioxidant. Some studies suggest that selenium deficiencies are associated with a 3x greater risk of major depressive disorder! It is also a powerful antioxidant that can fight inflammation and increases endogenous glutathione (you’ll remember from the liver health post that glutathione is also essential for detoxification). Sardines have a fantastic omega-6:omega-3 ratio. A good omega-6: omega-3 ratio is about 4:1, or even lower. The Standard American Diet has a ratio of about 20:1 or higher! This ratio is important in the prevention of cardiovascular disease and a good ratio is associated with a decrease in total mortality. Again, with selenium. Even small deficiencies in selenium can contribute to the development of cardiovascular disease. That’s not to say you should start downing selenium supplements. Too much of a good thing can be a not-so-good thing. I’d rather increase my intake of dietary selenium from foods like sardines, and get the necessary co-factors that come along with eating a food in its whole form. Your body uses vitamin B12 as a cofactor for many processes and, while B12 is only required by a few bodily enzymes, those enzymes are crucial. A disruption in any of these enzyme processes can lead to a disease state. Vitamin B12 plays an important role in methylation, a process that produces one of your most important antioxidants, glutathione. Selenium is also super awesome when it comes to immune function. It is a powerful antioxidant mineral that has cancer-protective properties. [20, 21, 22] It can also help prevent damage to DNA and cell membranes. Low selenium levels are associated with under-active thyroid, low immune function, premature aging, cancers, and other chronic illness. Your immune system also needs vitamin D. Vitamin D supports immune system modulation. It strengthens the immune system by producing compounds cathelicidin and defensins, anti-bacterial and antiviral proteins. It may also prevent the risk of getting a cold or the flu. Sardines are loaded with calcium. They could even be considered the best source of dietary calcium, with 3.5 ounces of sardines containing about 382 mg of calcium! That’s more than double the calcium in cow’s milk. Sardines are also one of the few dietary sources of vitamin D and contain a small amount of vitamin K. Vitamin D and vitamin K are needed for proper absorption and use of calcium. While calcium provides bone structure and strength, vitamin K moves calcium into bones and keeps it from settling in the arteries. Vitamin D supports this process and helps keep calcium moving from the bloodstream to the bones, where it belongs. Sardines are also a great source of phosphorus, with 64% of your daily requirement in just over 3 ounces of sardines. Phosphorus and calcium work together for healthy teeth and bones (85% of phosphorus is found in bones as hydroxyapatite). Maintaining a balanced ratio between calcium and phosphorus is important. Sardines are further down on the ocean food chain, and their consumption has a low environmental impact. You’re much less likely to find toxins like mercury and PCBs in fish and organisms lower on the food chain. Look for Pacific sardines. The Monterey Bay Aquarium has listed them as a “best choice.” This means they have to meet strict criteria to be low in toxins and friendly to the environment. I personally like Wild Planet Sardines. You: But, Candace. I don’t like sardines. They are fishy and oily and I just can’t do it. Me: I get it. I’ve been there too. Like many new foods, recipe experimentation is key to making certain things more palatable. Here’s my favorite way to eat sardines. After dreaming up this delicious and nutritious recipe, I can’t get enough of these slippery little suckers. I try to eat sardines 2-3 times per week. Give it a try and let me know what you think! Wood, Rebecca Theurer. The New Whole Foods Encyclopedia: A Comprehensive Resource for Healthy Eating. New York, NY: Penguin, 2010. Print. No need to twist my arm. Love them. Nice, Joe! Any favorite ways to eat them?